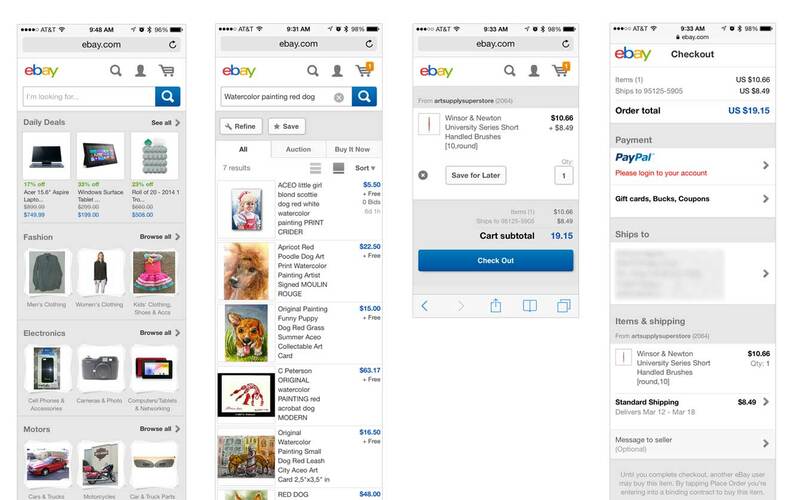 I collaborated with product management, development, QA and research teams, and mentored an intern, to release new features along with improvements to existing experiences on eBay’s mobile website. I also worked with lead designers from our other products to ensure consistency across different platforms. For example, when I introduced shopping cart with multi-item checkout to mobile web, I leveraged research that had been conducted on our iPhone and Android apps to make improvements, such as implementing inline, instead of modal, item editing. Other new features and improvements during my tenure included: a minified eBay Feed for the mobile web homepage; a content-driven signed-out experience for the eBay mobile web homepage; a redesigned search results page with larger product images, layout views that were optimized for price (list view) or image (tile view) comparison, the ability to swipe-to-Watch items, and other layout enhancements; SEO landing pages; a redesigned My eBay section that resolved information architecture and navigation issues; a redesigned category browse experience; multiple entry points for app deep-linking; and a site-wide visual refresh. I also was responsible for managing a design intern for the project as well as presenting designs to our leadership teams.